The Keukenhof is a huge park garden in Holland which has over 7 million bulbs planted each year. 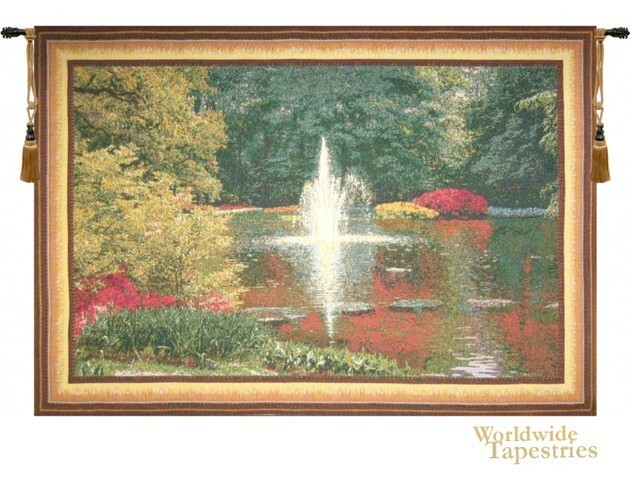 The Kuekenhof V tapestry here shows a lake with a fountain among the expansive gardens. The scene is punctuated by yellows and pinks which also provides color in the reflections on the water. This Kuekenhof V tapestry is backed with lining and tunnel for easy hanging. Note: tapestry rod and tassels, where pictured, are purchased separately.